On this day trip from Los Angeles to San Diego, enjoy a full day trip by rail from LA to San Diego. In this family-friendly day of fun, step aboard a Hop On Hop Off bus and visit San Diego's most famous sites. Kids will enjoy seeing the Old Town Market, Casa de Aguirre, Herritage Park, Whaley House, and so much more. You'll also enjoy a 2-course lunch at the Hard Rock Cafe. All aboard! Leave the traffic problems at home while you relax aboard an Amtrak Regional train for a day in San Diego. Take a nap on the comfortable roomy seats or stop by the Café Car. Before you know it, you'll be in San Diego train station. With a mid-morning arrival, it's just a few blocks to pick up your included tickets for a memorable hop-on hop-off tour of San Diego. Stay on the bus or hop off at the stop of your choice. There's something to do at nearly every stop on a variety of loop tours. Visit museums, observatories, zoos, boat rides, and enjoy the Old Town Markets. All are everlasting fun even if you've experienced them before. Enjoy the hottest, hippest upcoming area of San Diego with galleries, micro breweries, coffee bars galore and plenty of history! 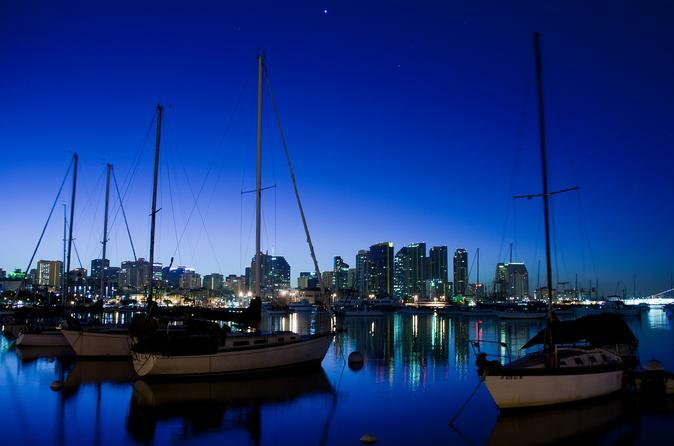 San Diego is a distinctive tourism experience for a variety of interests. With over 70 miles of beaches, its great for surfers, divers and beach lovers. There's SeaWorld, San Diego Zoo or Balboa Park. As you travel back to the center of San Diego, enjoy a 2-course lunch with a VIP Priority Seating program at Hard Rock Cafe. Located in the heart of the historical Gaslamp quarters.